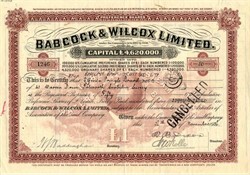 Beautiful certificate from the Babcock & Wilcox Limited issued in 1936. 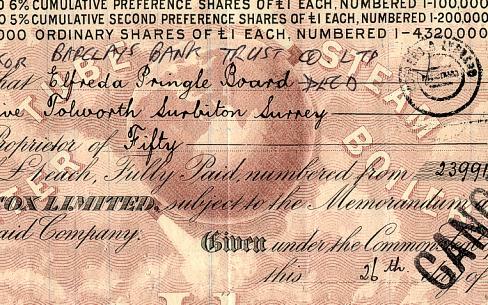 This historic document was printed by Waterlow & Sons Company and has an ornate border around it with underprint of a world globe with the words " Tube Steam Water Boiler". This item has the signatures of the Company's Director's and Secretary and is over 76 years old. The Babcock & Wilcox Company (B&W) is an American firm engaged in the design, engineering, manufacture, service and construction of power generation and pollution control systems and equipment for utilities and industries. Babcock & Wilcox boilers supply more than 270,000 megawatts of installed capacity in over 90 countries around the world. During World War II, over half of the American US Navy fleet was powered by Babcock & Wilcox boilers. The company is based in Lynchburg, Virginia and is a unit of McDermott International, Inc. B&W also has operations in West Point, Mississippi, Cambridge, Ontario, Canada, Mount Vernon, Indiana, Oak Ridge, Tennessee, Barberton, Ohio, and Euclid, Ohio. In 1867, Providence, Rhode Island, residents Stephen Wilcox and his partner George Herman Babcock patented the �Babcock & Wilcox Non-Explosive Boiler�, which used tubing to generate higher pressures and was more efficient than existing designs. Babcock & Wilcox published a useful reference book titled Steam - its generation and use , currently in the 41st edition. In 1942, the company developed the cyclone furnace. Babcock and Wilcox designed and built the nuclear reactor that was involved in the Three Mile Island accident. On November 26, 2007 Babcock & Wilcox and BWX Technologies were merged into a single company. Babcock & Wilcox has over 140 years of manufacturing and operations for civilian, national security and high-consequence applications. 2007 Consolidation of B&W and BWXT operations, under the name The Babcock & Wilcox Company. Formation of Babcock & Wilcox Nuclear Power Generation Group, Inc.